The Frogman (7602) was an incredible set, unfortunately made of a very perishable rubber. It is difficult to find a uniform out of the package that is still flexible. Suits left on Joes over the years often melt to the body, and can damage other sets stored with them. There have been many suggestions about how to preserve these suits, but other than airtight containers away from all light, in a climate controlled space, none seem to work well. Frogman accessories were available as a window box set (above), or as four separate small cards (7603, 7604, 7605, 7606) (below). The set is said to have also been sold at Sears as a dressed figure in the Action Sailor box, which makes sense since they share box art. 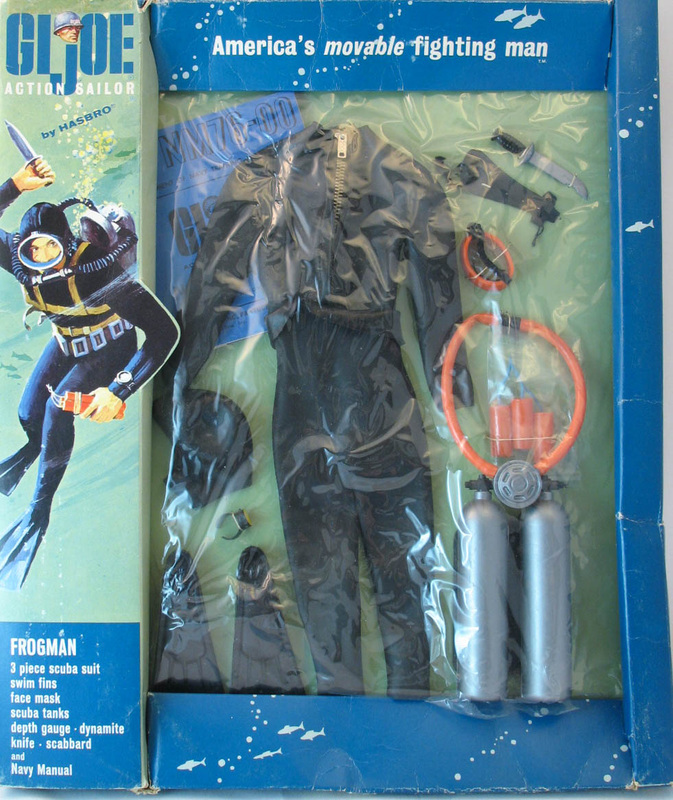 The best way to find a flexible black frogman suit is to buy a packaged example, but even those can harden, not to mention the inherent anxiety involved in ripping open a sealed piece of GI Joe history. The set was re-released in 1968 in a very rare photo box, below. Image courtesy of Joezeta. It has been said that photo box occasionally included an orange suit rather than a black one, but I don't have any verification of that.